May Denison from Denise Swanson’s New York Times bestselling Scumble River mystery series talks about her cruise. Jed had us at Midway Airport for out flight to Fort Lauderdale so dang early, I was pooped, but I knew it wouldn’t be polite to skip the knitting group’s welcome aboard get-together so I dragged myself to the party. Now I’m a God fearing woman who tries always to extend the hand of Christian kindness to others, but heavens to Betsy, that woman leading the knitting group sure knows how to get under my skin. As we say back home in Scumble River, a small town in Central Illinois, she is a doozy of a floozy. First, she attacks my yarn choices, then she looks down her snooty nose at my knitting ability, and she rounds the whole shebang off by flirting with my husband! I was madder than a wasp being sprayed with a can of Raid when she fluttered her eyelashes at Jed and cooed about his strong arms. Too tired to deal with the likes of that hussy, I grabbed Jed and headed to our cabin. My good humor was restored when I caught a glimpse of Skye and Wally waiting for the elevator. They are going to make such beautiful babies. The shocked look on Skye’s face was priceless. I was afraid to stop to say howdy because as usual, Jed was a flight a head of me on the stairs and I was afraid I’d get lost if I didn’t catch up with him. But won’t Skye and Wally be excited to find out Jed and I are here to share their honeymoon with them? I can’t wait to see them at dinner tonight. 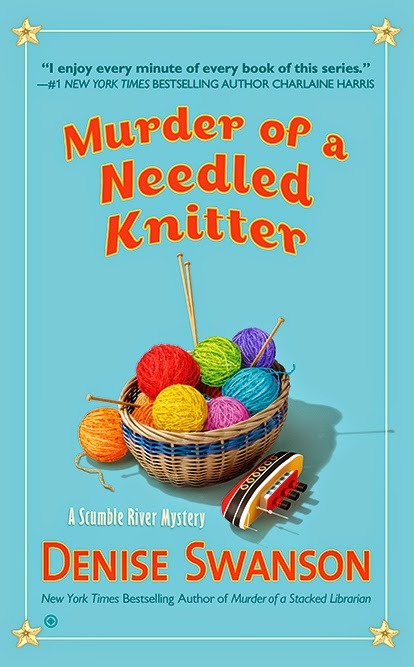 Keep your fingers crossed that no one kills that stuck-up knitting woman, because Skye can’t resist investigating a murder and that wouldn’t be right on her honeymoon. Poor Skye and Wally. This situation sounds more like the honeymoon from hell or the cruise from hell. LOL! Hi May, I'm so glad you could go on the cruise with Skye and Wally! They'll have to accept it now. Looking forward to finding out what happens on this trip.........Lorraine.